But for years, the continent’s scientific community has been plagued by problems ranging from the lack of funding interest from all sectors to scientists and researchers being woefully underpaid. These problems and many others often contributed to African scientists leaving their native countries in search of work elsewhere in the world, a damaging brain drain at the highest level. Over the past decade or so, Africa’s scientific landscape began to evolve and around 2010, it appeared as though Africa was on the verge of a scientific renaissance. This resurgence wasn’t equal across all countries of course, but it was significant enough for the international scientific community at large to take notice, including big science-minded nonprofits like the Howard Hughes Medical Institute and the Wellcome Trust. With some $18 billion in assets, the Howard Hughes Medical Institute (HHMI) is a behemoth in the world of science philanthropy. Its investments in U.S. biomedical research totaled $660 million in 2015 alone. Wellcome Trust is no slouch either with a £16 billion to £18 billion investment portfolio. Now they've joined together to boost science in Africa. Wellcome Trust and HHMI recently embarked on an $83 million joint venture to launch the South Africa-based Africa Health Research Institute. Described by HHMI as a “ground –breaking new interdisciplinary institute to fight tuberculosis, HIV, and related diseases,” the institute combines data from the Africa Centre for Population Health with basic science and experimental medicine at the KwaZulu-Natal (KZN) Research institute. One of the main goals of the work here is to work toward the elimination of HIV and TB by taking a “population to laboratory and back to population approach to addressing the TB and HIV co-epidemic.” HHMI’s press release states that this collaborative effort comes at a “critical moment” as TB is one of the leading causes of death in South Africa and KZN is among African nations with the highest HIV burdens. HHMI has been growing its presence in international science for a while now. In 2012, it launched its Early Career Scientist Program which awarded five-year, $650,000 grants to 28 young scientists across 12 countries establish independent research programs. While its international science investments took a dip in 2014 to $8 million, down from $25 million the previous year, it appears to be on upward trend with the institute contributing $11 million toward the support of international sciences in 2015. Wellcome Trust on the other hand, has had its eye on supporting international scientists for some time. As that funding to Africa, the trust has been pretty keen on bolstering scientific autonomy as of late. In 2015, Wellcome Trust, along with UK Department of International Development (DFID) and the Gates Foundation contributed a collective $4.5 million to establish the Alliance for Accelerating Excellence in Science in Africa (AESA), which will allow scientists in Africa decide how and where their research dollars from global funders will be spent. 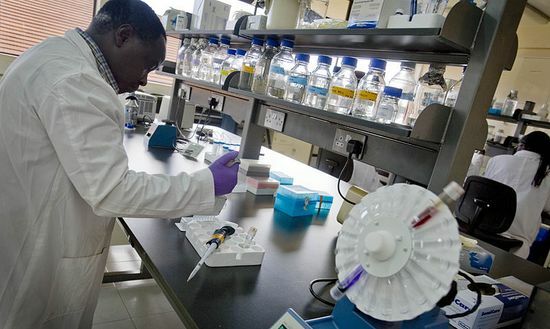 That investment was aimed at solving the problem with African scientists’ lack of autonomy for research funded by foreign dollars, which often times, reflects the priorities of the donors and overlooks major health concerns in Africa. Related: What’s Behind This Ambitious Push to Boost Biomedical Research Worldwide? The trust initially committed $60 million over that five-year period to support the initiative and earlier this year made good on part of that commitment by putting up an additional £21 million toward DELTAS. HHMI and Wellcome Trust are key actors in the global science community at large, but in the matter of scientific research in Africa, they are just two of the very few players in the field. That’s not to say that other like-minded funders are contributing to building Africa’s scientific capacity by funding programs related science, technology, engineering, and math (STEM) education. But funding for scientific research in Africa remains a relatively uncrowded funding field. It’s a good thing that the continent has these two powerhouses in its corner.